One of the most importants facts about Jamaica is the concept of time. We are notoriously laid back when it comes to punctuality, which translates into us being notoriously late for events, appointments and life in general! We even have our own term, "Jamaica Time", which means anything from 10 to 50 minutes or so after the appointed time (within 10 minutes is considered punctual). On this page I'll attempt to give you a quick look at our island. Useful background information mixed with small doses of trivia about Jamaican life. Did you know that most Jamaicans are morbidly scared of lizards of any size? Or that we like to eat the ice that's left at the bottom of our glass when the drink is finished? Read on to learn more about Jamaica and Jamaican life. Jamaica is located in the Greater Antilles, and is bordered on all sides by the Caribbean Sea. The island's nearest neighbours are Cuba to the north and Haiti to the east. The area of Jamaica is 10,991 sq. km (4,244 sq. miles). St. Elizabeth (1212 sq. km). Jamaica's longest river is the Rio Minho, in the parish of Clarendon. TheBlack River in St. Elizabeth is the longest navigable river. Kingston is Jamaica's capital city. The original capital was Spanish Town in St. Catherine. The population of Jamaica is approximately 2.7 million (2008), of which about 800,000 live in the Kingston and Portmore area. Although so many Jamaicans live near the sea, the majority do not know how to swim. Many of Jamaica's National Symbols were instituted when Jamaica became independent on August 6, 1962. 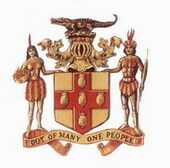 The National Motto is "Out of Many, One people". The National Bird is the Swallowtail Hummingbird, known locally as the Doctor Bird. The National Flower is the Lignum Vitae. The National Tree is the Blue Mahoe. The National Fruit is the Ackee. The National Anthem is a prayer which begins "Eternal Father bless our land". It replaced the British National Anthem, God Save the Queen". The National Dish (by consensus, never officially declared) is Ackee and Saltfish. Click here for the words, music score and a simple vocal rendition of theJamaican National Anthem. Jamaica is one of the only countries in the world where Ackee is eaten. Jamaica has six National Heroes and one National Heroine. Marcus Garvey, 1887-1940, born in St. Ann. International figure who promoted the concept of black pride and black power. Sir Alexander Bustmante, 1884-1977, born in Hanover. Extraordinary labour leader, Jamaica's first prime minister. Norman Washington Manley, 1893-1969, born in Manchester. Lawyer, at the forefront of Jamaica's nationalist movement. Samuel Sharpe, 1801-1832. Slave leader, Baptist Deacon, hanged for his role in Christmas Rebellion of 1831-1832. Paul Bogle, d.o.b.uncertain - 1865. Native Baptist Deacon, peasant leader, hanged for his role in Morant Bay Rebellion of 1865. George William Gordon, 1815-1865, born in St. Andrew. Champion of rights for small settlers. Hanged for his supposed role in the Morant Bay Rebellion. Nanny of the Maroons. Freedom fighter, spiritual and military leader of the eastern Maroons. Although not an official hero, the Hon. Louise Bennett Coverly (Miss Lou) is regarded by many as Jamaica's cultural hero, for her role in promoting the acceptance and celebration of Jamaican patois as a legitimate means of expression. Jamaica's system of government is a parliamentary democracy. The laws of Jamaica are made by its Parliament. Parliament consists of an elected House of Representatives and a nominated Senate. There are 60 members of the House of Representatives (Members of Parliament), and 21 Senators. The majority party is called the government, the minority party is called the opposition. The leader of the majority party assumes the role of Prime Minister. The current (2009) Prime Minister is Bruce Golding. The control of government lies in the hands of the Cabinet, which consists of the Prime Minister and at least 11 other ministers. Historically, the government has been formed by the two major political parties: The People's National Party (PNP) and the Jamaica Labour Party (JLP). The current ruling party is the PNP. Jamaica's formal Head of State is the ruling British Monarch, whose function is mostly ceremonial. The Governor General is the representative of the monarch on the island. At election time Jamaicans are careful what they wear. The PNP's colour is orange, the JLP's is green. The main sports are cricket, football (soccer), track and field and netball. The main religion in Jamaica is Christianity. The main industries which employ Jamaicans are tourism, agriculture, bauxite, manufacturing and fishing. Many Jamaicans are employed in education, health and security sevices. We drive on the left side of the road. Well, we're supposed to. Although ganja (marijuana) is widely used and cultivated, it is an illegal drug. Jamaica's official language is English, although most conversation is carried out in a mixture of English and Jamaican patois. Many Jamaicans either add H's to their words, or drop them off. Head may be pronounced "ed", and egg as "hegg". I could exhaust you with many more facts about Jamaica, but I think I'll leave you some to discover for yourself when you visit. Come soon. If there's anything else you'd like to know, please use the contact formon the About/Contact page to get in touch with me. I'd be happy to hear from you. In addition to these facts, here are some useful travel tips for Jamaica. This page gives an in depth look at Jamaica's climate. And check this out if you want to know exactly "Where is Jamaica?"